The firm successfully represented Robert Gregg Roy and Nica Sara Orlick-Roy, Debtors, in a nondischargeability proceeding in the United States Bankruptcy Court for the Northern District of California, San Francisco Division, which proceeding alleged that a pre-petition debt in the amount of $316,000.00, plus pre-judgment interest thereon at the highest rate authorized by applicable law. should be deemed nondischargeable under 11. U.S.C. § 523(a)(2)(A). See Adv. Proc. No. 12-3033 HLB. In a well-written memorandum decision, Judge Hannah L. Blumenstiel concluded that Plaintiff failed to prove that Plaintiff justifiably relied on Defendant’s representations concerning pre-petition investment in the Debtor’s travel business, Siemer and Hand, Inc. You may read a true and correct copy of the memorandum decision here. 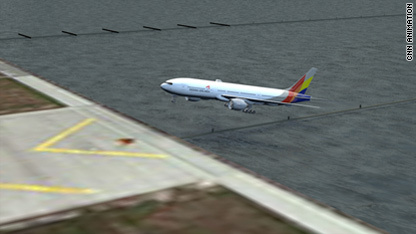 Belvedere Legal, APC is currently investigating the Asiana Airlines Boeing 777 passenger jetliner arriving from Seoul, South Korea, that crashed and caught fire while landing at San Francisco International Airport. Early reports indicate two people were killed and at least 40 people were critically injured. Deborah Hersman, Chairwoman of the U.S. National Transportation Safety Board, recently reported that the onboard crash systems warned the crew the plane was about to stall four seconds before the crash. The Boeing 777 was traveling at approximately 106 knots (122 mph) upon impact and at about 118 knots (136 mph) 16 seconds before impact at an altitude of about 200 feet; the recommended speed upon approach to the runway threshold is 137 knots (157 mph). 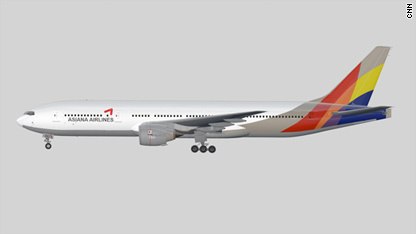 South Korea’s Asiana Airlines has also admitted that pilot had flown the 777 model only nine times had only 43 hours of flying time prior to the flight. 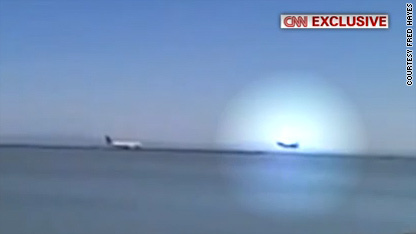 What happened with Asiana Flight 214? The flight descended faster and more steeply than previous flights on this same route. 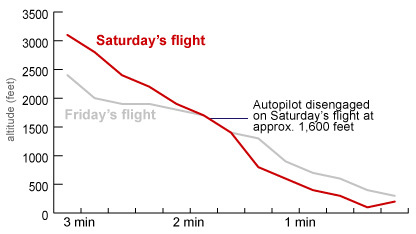 The graph to the right, showing approximate altitude data from FlightAware.com, displays approach information from the same flight the day before the crash and Saturday’s approach, which indicates a steeper decline in altitude. A preliminary readout from the flight data and cockpit voice recorders shows the aircraft was approaching well below the target landing speed of 137 knots (157 mph). At seven seconds before impact, the pilots are heard acknowledging the slow speed and attempted to spool up the engines to increase the plane’s speed. At four seconds, the plane’s computer triggers a “stick-shaker” warning, indicating an impending aerodynamic stall. A stall occurs when there is not enough airspeed to sustain lift to keep the aircraft in flight. The flight data recorder shows the lowest recorded airspeed during the approach, at 103 knots (118 mph). At this time, the engine power was recorded at 50% and increasing. Both engines were producing power up to the time of impact, according to investigators. At 1.5 seconds before impact, the pilots call out for a “go-around,” an attempt to abort the landing. Passengers on board describe hearing the engines spooling up and the nose tilting up just before impact. The flight data recorder indicated an airspeed of 106 knots (122 mph) at the time of the crash, well below the targeted 137 knots. 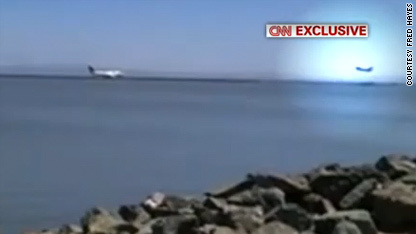 Based on the debris field and the video obtained by CNN, the aircraft appears to have struck the rock sea wall well before the start of the runway. There are marks on the sea wall consistent with an impact of some part of the plane. NTSB investigators discovered the lower portion of the tail cone in the rocks of the sea wall, as well as a significant piece of the tail found in the water. Additional parts were reportedly visible in the water at low tide. 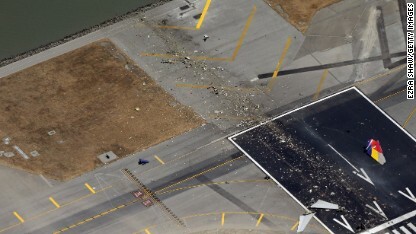 The debris field runs from the water, slightly right of the paved threshold and runway center, all the way to the stopped aircraft fuselage. The rest of the Boeing 777’s tail section, including its vertical and horizontal stabilizers, was found near the end of the paved threshold, just before the start of the runway. Total loss of the tail section would have made the aircraft extremely difficult to control. The fuselage came to rest off the left side of the runway, and it’s pointed toward the right. The right engine is detached from the wing and wedged against the right side of the fuselage. 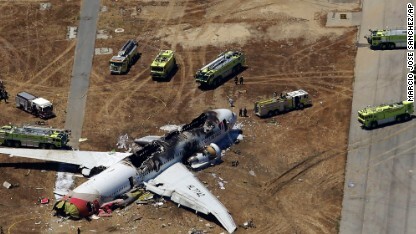 The left engine detached from the wing during the crash and is a considerable distance from the fuselage in a grassy area to the right of Runway 28L. 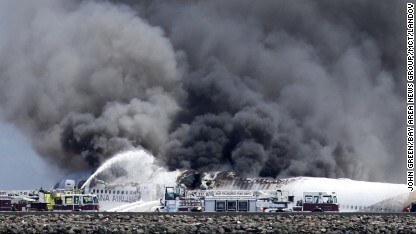 Most of the fire damage to the aircraft occurred after the Boeing 777 came to a stop on its belly. Passengers described the cabin interior as heavily damaged, with overhead bins dropping and at least one life raft/escape slide inflating inside the aircraft, trapping a flight attendant, whom passengers helped free. The coroner says one of the two passengers killed appears to have been run over by an emergency vehicle, but final cause of death has not been determined. Asiana has identified the two deceased as Ye Mengyuan and Wang Linjia of China. Both were 16. The first Boeing 777 went into service in 1995. It has a maximum range of 7,725 nautical miles, with a typical cruise speed of about 570 mph. 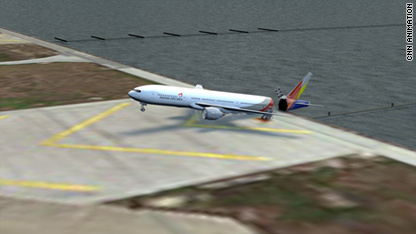 Asiana Airlines took delivery of the aircraft involved in Saturday’s crash landing in 2006. It is one of 12 Boeing 777 aircraft in Asiana’s fleet. Only one other incident involving a Boeing 777 resulted in a complete loss: British Airways Flight 38 from Beijing landed short of the runway at London’s Heathrow airport in January 2008 after engine trouble shortly before landing, blamed on fuel icing after a lengthy flight over Siberia. No one died in that incident. Design changes were made to the 777 to minimize fuel icing when flying routes over extremely cold regions. Confirmed a Chapter 11 Plan November 20, 2012. Debtor had over two million dollars worth of general unsecured debt. Debtor was able to utilize bankruptcy protection to liquidate certain real property, restructure liabilities and retain other property, and provide a 2% dividend to general unsecured creditors.